I told you about the Pittsburgh Dumpling Experiment, remember? Well, we did it, it’s over, it was lots of fun and we didn’t win. But we really did win because it was such an awesome event and we made some fun new food lovin’ friends. Even if you aren’t from Pittsburgh, you should really go back and check out the link, because the Food Experiments are doing all sorts of different food competitions featuring amateur chefs all over the US. Check out their tour and plan to compete or at least attend one – Brooklyn Brewery is doing an amazing job staging them at quirky venues all over. 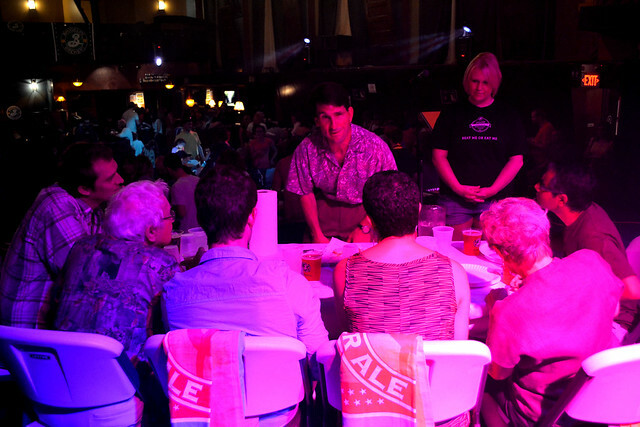 This was my first food competition and I learned a thing or two if I ever do it again. 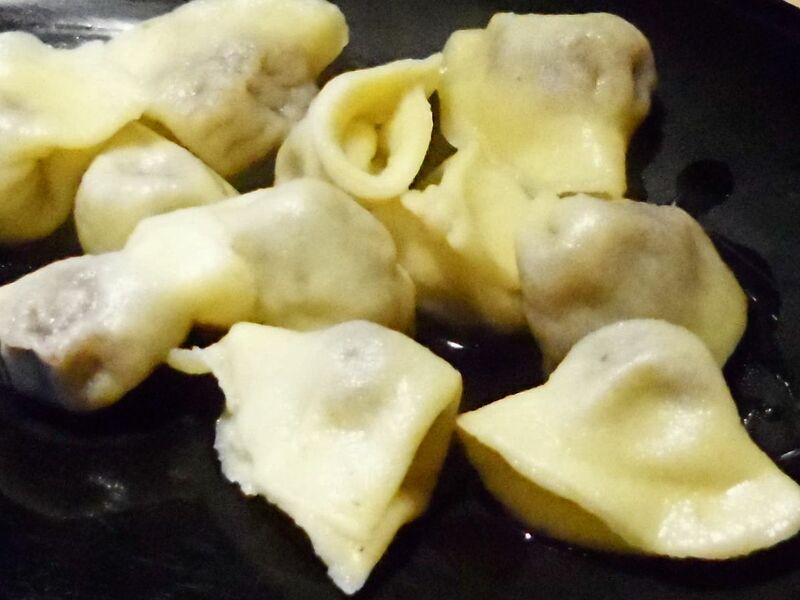 In case you forgot, our dumpling was a mincemeat filled cappelletti with mushroom sauce. For me, an unexpected pleasure was the reaction from people as you handed them a dumpling and told them it was mincemeat. Young people showed no flinching or signs of tortured mincemeat history; their minds were open. Conversely, the most enthusiastic AND the toughest mincemeat sell was with our mature crowd. They either were excited or totally shut down when they heard the word mincemeat. Now, I’m no food historian, but it isn’t hard to see that many have been scarred by unpleasant mincemeat pasts. The result is that young food lovers seem to have no expectations or icky memories and were completely open to an offbeat new farmstead DIY experience. My cousin Guy was the captain of this ship since he’s the pasta maker in the family. If it were left to me, our pasta life would be pretty uninspired, but hey. It’s pasta. Uninspired but properly cooked is still pretty awesome. 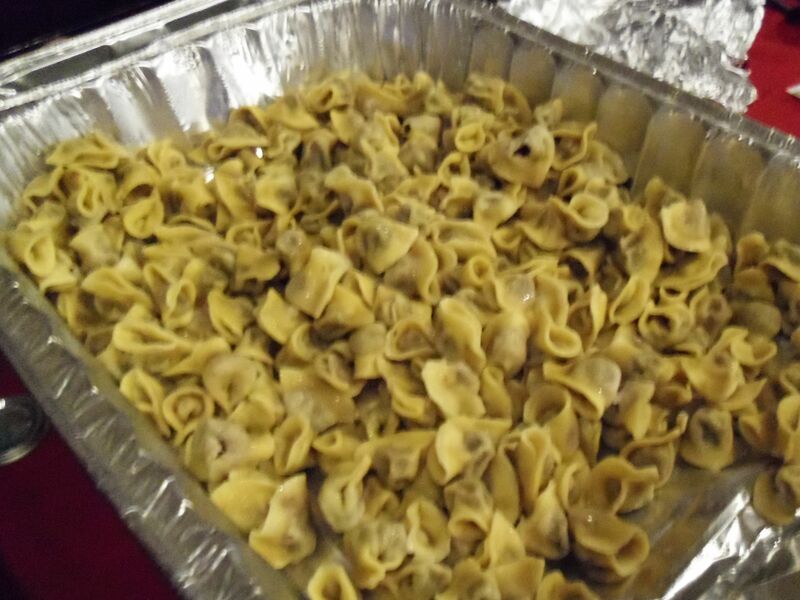 Guy and I made cappelletti – Italian for “little hat”. 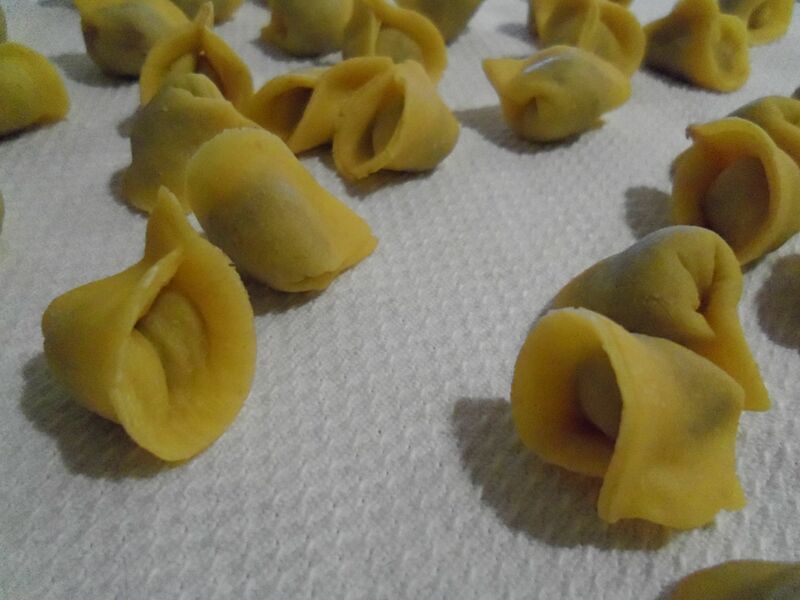 Cappelletti are like tiny tortellini or ravioli – a beautiful, petite little dumpling you can stuff with meat or cheese filling. They look like, you guessed it, little hats, and float beautifully in soup, and make a great main dish or appetizer. Since mincemeat has been on the back burner of my mind for a long time, this seemed like a good opportunity to take it out for a modern-day spin. 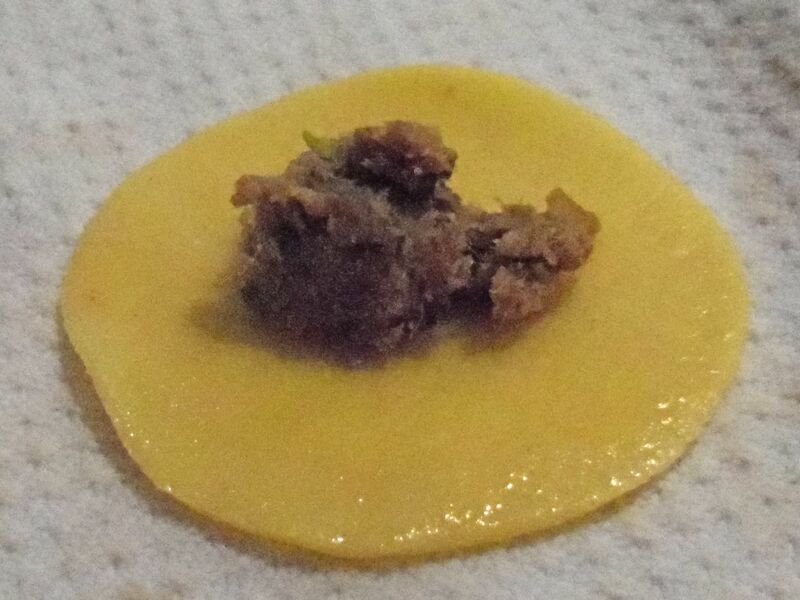 So I crafted a mincemeat filling based on the idea I got from Paul Bertolli when I made my consommé. You remember, don’t you? If you’d like to try it yourself, you’ll find the recipe here. I’ll just say this: as expected, the difference between real, home-made mincemeat and commercial jarred is beyond belief. Pie, tarts, cookies, meat filling or any mincemeat project you are considering, don’t even bother if you’re using commercial. If you want to do mincemeat, go all the way or don’t bother going at all**. Real deal mincemeat made with meat, suet, fruits, nuts, spices and liquor has roots as far back as the 13th century when returning European crusaders brought home Middle Eastern recipes. The rich combination of exotic ingredients is attributed to both religious significance and food preservation – and I’m sure the fact that it’s a great way to disguise the off flavor of too-old meat may have had something to do with it too. These days, modern recipes for mincemeat sometimes include suet (beef fat), but rarely include meat. Our modern expectation is for a sticky, dense, heavily spiced winter fruit, nut, molasses and liquor affair; very rich and sweet. Loved by a few loyals, feared and avoided by everyone else. Of course, I have no interest in modern mincemeat – I want the old school, farmwife classic with real meat and beef suet. I used a Devon roast, and my suet was from my local butcher. My current mincemeat recipe is my tentative favorite, thank you Hugh Fearnley-Whittingstall. The River Cottage Meat book nearly always comes through with a modern version of some offbeat farmstead meaty classic. I’m very satisfied with this as is, but I’m still tweaking my fruit & spice combo in search of a signature blend. The seasoning part of the recipe is forgiving, but do stick to the ratios of meat, fat and other ingredients. I keep jars of mincemeat at the ready; I keep them in a spare refrigerator and have used them with good results up to two years old. Having fully embraced mincemeat, I’ve tucked away a few favorite pastry recipes that I guarantee will not be duplicated at your next cookie or pie swap. But, as I often do, I’m getting ahead of myself. Today we’re just talking mincemeat and savory mincemeat filling. Cookies, pies and other holiday mincemeat stuff later – you don’t want to miss strawberry kickoff spending your time on out of season mincemeat pastries do you? I didn’t think so, although soon it is time to get the best seasonal grass-fed beef and putting up your mincemeat now so it’s well cured by the holidays is a good and well-timed idea. Here’s how I adapted mincemeat to work as a meat filling without turning the whole dish into a sickeningly rich and heavy plate. If you’re not into the ravioli-making part, you can also just use regular pasta and add some filling directly to your favorite sauce – I recommend a simple mushroom, beef or white sauce, or even just good quality butter. It’s not quite the presentation the cappelletti or ravioli are, but good food is good no matter what shape it is, right? Here’s the recipe for Guy’s mushroom sauce – it was a perfect compliment to the mincemeat if I do say so myself. Since I’m the filling part of the team, not the pasta part, I’m going to hand you off to Lidia Bastianich for a great recipe for ravioli. And, if you don’t have a pasta maker and have no interest in getting one, don’t let that stop you. You can roll these babies out by hand – here’s some conversation with good tips for doing just that on Serious Eats. One last thing – whenever I make anything like this, I always double the recipe and freeze some so I can enjoy a special, quick meal one future day I really need a boost. These freeze well, just be sure to freeze them in a single layer first, before tossing them into a freezer bag. Otherwise, the fresh pasta will stick together and you’ll have one massive ravioli clump. Which may be exactly the way you like it, don’t let me rain on your clumpy ravioli parade. **Forgive me if I’m uninformed – if you know of an awesome, commercially produced, real meat mincemeat let me know. I have not the foggiest idea of what I would stuff! Not a clue, I’m afraid. But I do have to tell you that you never fail to surprise me with your culinary creativity. Amazing! You’d know exactly what to stuff if we were talking spinach or mushrooms, lol. Jackie, Jackie, Jackie … I just LOVE this post! Funny stuff about how us ‘mature’ folks have preconcieved mincemeat fears … quite similar to fruitcakes! And by the way, I don’t care what the judges ruled … I say you and Guy are winners! I fall into the shielded category. If my mom didn’t like it, we didn’t eat it. Period. That’s why the holiday relish tray was such a big deal – OLIVES! I agree. I hadn’t even thought about mincemeat for years! Good for you for the revival. Love the look of your cappellettis. and the whole thing sounds like fun. Thanks Tammy, it was fun. It might have been more fun to just attend because all I saw all afternoon was these plates full of yummy things I didn’t have time to taste!